The holidays are hear and so are pumpkins, squashes, cranberries and hearty foods. I love holiday foods and spices and I have found a way to enjoy one of my favorite dishes without all the unnecessary fillers, dairy, and processed sugars and have it be a complete healthy easy meal! This recipe is a fun way to enjoy the holidays! 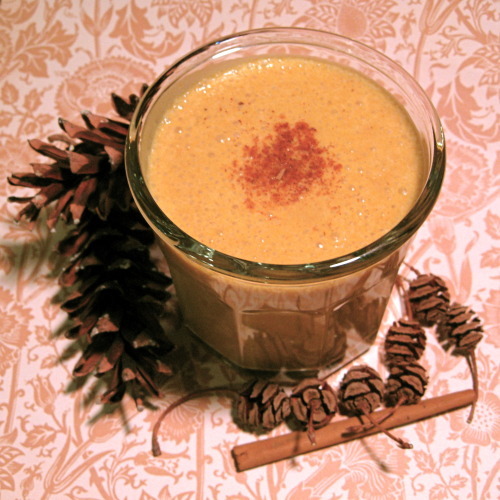 It’s a pumpkin spice smoothie and it tastes like pumpkin pie filling! Hmmmm…a wonderful treat. Really take advantage of the high nutrient foods of the season. Pumpkins are high in beta carotene, antioxidants, high fiber, Vitamins C,E, A and is low glycemic. We love that! It’s a great source of protein (15g or more) and 10g fiber. The added almonds and cashews add a creamy texture and lots of essential fats. This recipe makes 20oz of smoothie and approximately 370 calories so for a guy, you will need to double the pumpkin and add more almonds. Let’s get started! Check out my video to see how I made it. Add water and ice to blender cup and mix in pumpkin puree. Take the almonds and cashews that you’ve soaked for 12 hours and add them to the mix. Add in the cinnamon, nutmeg, vanilla extract, mineral salt, coconut butter, rice protein and sweeteners and blend on high for 1-2 minutes or until done. Looking for an extra bit of nutrients? Add 2 handfuls of fresh spinach leaf and add to mix! Remember- A typical Thanksgiving dinner is 2,700 calories-4,000 calories. Enjoy yourself without stuffing yourself like a turkey. What a little darling you are! Just when I need a helping hand with my eating war-up pops Kardena! I cant wait to make this, I just know it will make my day special and lift my spirits. Thank you. Thanks, I hope you really enjoyed the smoothie! This recipe looks absolutetly delicious. I have a pumpkin sitting on my kitchen table and was wondering what I could do with it, besides make a pie. (I don’t bake), but I do make smoothies almost daily. Thanks for the great suggestion! I look forward to enjoying this recipe! Thank you for sharing this delish fall recipe! I am very high raw and looking to add a yummy vanilla rice protein powder into my diet. Any brand you could recommend? Thank you. I would use raw hemp seeds or ground into powder. Vega is another option. Enjoy! Someone sent me a recipe a few days ago. Looked great. Pumpkin smoothie. I checked my email today and saw a link from you to a pumpkin smoothie. Cool I thought. Another pumpkin recipe. Awesome recipe. I look forward to trying it. I made your smoothie exactly according to your directions, doubling everything because I am a man and I wanted to make a pitcher instead of a glass and it was soooooooooooooooooooooo good! I was so full I didn’t eat much turkey! I made another one the next day, instead of using Rice Milk I substituted Organic Hemp Vanilla Spice and it was also yummy! Love your recipes! Keep them coming. I’m glad you like them as much as i do! This a a fabulous smoothie! My kids loved it, even with the spinach! Thanks for the recipe K!! !